The Royal College Tamil Debaters' Council was originally formed in 2006. But the Royal College Tamil Debating Team was earlier functioning as a part of the Royal College Tamil Literary Association which was established in 1938. The Royal College Tamil Debating Team is considered as one of the Oldest Tamil Debating Teams of Sri Lanka. In early days Royal College Tamil Literary Association was mainly focused on debating, but later it diversified its focus onto various other literal activities, Thus is 2006 The Royal College Tamil Debaters' Council was formed to fully focus on the field of debating and to nurture and develop the Tamil debating skills among young Royalists. The Council Annually Organizes the Royal Thomian Tamil Debate Encounter in collaboration with the S.Thomas' College Tamil Literary Association. This is an Annual Tamil debate between Royal College and St Thomas' College for the Kulasekaram Memorial Shield. 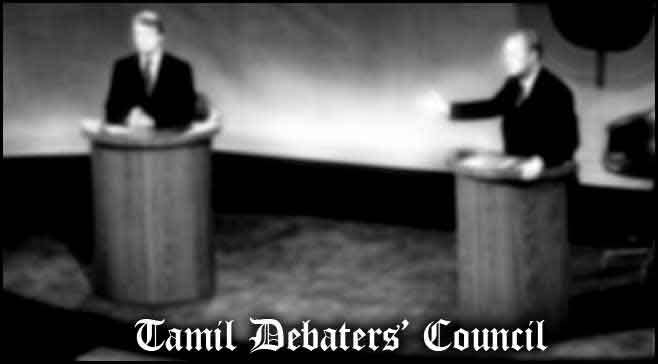 Held since 1994 this is the longest Tamil debating series in the world. In the contemporary the council along with the Sinhala & English Debating Societies is organizing an Annual All Island Trilingual Debating Contest to help & nurture the debating skills of other pupils in Sri Lanka. From 2007 the Council organizes an Annual All Island Inter Schools Tamil Debating Competition for the 'Royalist Shield'. This tournament is mainly concerned on developing the debating skills of young Sri Lankan pupils from all over the country and to give them opportunities to prove their talent. The council organizes an Inter-House Tamil Debating tournament every year for the 'Sir P.Arunachalam Memorial Shield' and also Inter-Grade Tamil Debating Tournaments for the selections of members. Membership of the Royal College Tamil Debaters' Council is very limited. The members are selected from grade 8 and above. The membership is limited to 5 per batch (grade). The members are selected from the Inter-Grade Tamil Debating Tournament. The maximum number of the members shall be approximately 40. The Royal College Tamil Debating Team is chosen from the members of the Royal College Tamil Debaters' Council by their performance in practices. The council has an advisory board. The President will be the Principal of Royal College and the Advisor is the Deputy Principal of the Tamil Medium of Royal College. There is one Senior Master in Charge and 3–4 Teachers In Charge. The Council is chaired by a Chairman and the Captain will lead the Royal College Tamil Debating Team. The Next position is the Secretary and the Vice-Captain is the second in command of the Royal College Tamil Debating Team. The Royal College Tamil Debaters' Council has its' own e-magazine 'VIVATHI' - The Debater. It contains articles on various topics and even writings of young Royalists. The Royal College Tamil Debaters' Council maintains closer relationship with Royal College Tamil Literary Association as it has been the Mother society of the Council from 1938 until the formation of the Royal College Tamil Debaters' Council in 2006. The 'Royalist Shield' Inter Schools Tamil Debating Competition is organized jointly with the Royal College Tamil Literary Association. The Royal College Tamil Debaters' Council also works closer with the Royal College Sinhala Debating & Oratory Society and The Debaters' Council of Royal College (English) in organizing the All Island Tri-lingual Debating Competitions.